Three ziplock back issues for just $72.00! Westerners have generally overlooked big events in the East-- unless someone like Genghis Khan or Tamerlane brings it to them. The only "Eastern" battle in the the Mitchell/Creasy "20 Decisive Battles that Changed the World" is Midway. But there have been many significant wars and battles on the far side of Russia. Now, the Asian Way of War looks at three of the most intense, fought entirely between Asians. Chronologically, the first is "Storm over Taierzhuang," a city battle every bit as terrible as Stalingrad, if not as cold. Then comes "Red Dragon, Blue Dragon," the decisive campaign that made China what it is today. Now, you can grab these three interesting titles at our lowest bundled price. Zip-lock versions of the games, complete with magazines, full color maps, die-cut counters, and any goodies that we conjured up since they were released. See how the Asian Way of War makes its mark on all of history. It sounds very familiar. An Axis army launches an offensive to take a key city, hoping this will be the final victory needed to knock an Allied giant out of the war. Except, the defenders anticipated the attack and set up an elaborate trap, turning the city into a fortress that had to be taken block by block and building by building. With most of the city captured, the defenders suddenly launched a massive attack on both flanks and virtually eliminated the Axis army. No, China, 1938. Probably one of the most decisive battles that hardly any gamers have ever heard of. Until now. A game designed to be easy to learn, re-playable and very interactive to play but still be a challenge for both sides! Red Dragon, Blue Dragon brings gamers face to face with the series of battles that finally tipped the balance of power in postwar China towards a Communist victory. You will see how the salient of Xuzhou and its implications toward Nanjing and Shanghai attracted seven whole armies from the Nationalist side and larger forces from the Communists, locked into a series of battles and maneuvers that saw whole armies destroyed, one after another. Pitting the PLA "People's Liberation Army"; the Communists ) against the GMD ("Guomindang"; the Nationalists), Red Dragon, Blue Dragon explores this critical campaign in depth, with 20km hexes, mostly corps-sized units, and turns representing one week of action. The GMD advantages include air support, rail movement, and convoys, while the PLA player benefits from pontoon bridges, guerrilla movement, and “fast marches.” Both sides can be affected by random events and there are even rules for GMD units “defecting” and a Deng Xiaopeng marker and effect! Differences like these give each side a distinctive flavor — it’s not just red counters against blue counters, but two worlds colliding. In 1975, two years after the last US troops left Vietnam, People's Army of Vietnam (PAVN) General Van Tien Dung launched Operation 275, a "limited" offensive designed to set up an attack on the provincial capital of Pleiko. Rapid collapse of South Vietnamese (ARVN) forces caused a change in plan, with PAVN forces quickly taking one city after another, pausing only before an attack on Saigon itself. Based on previous performance, when three full PAVN divisions, supported by tanks and ample artillery, attacked one depleted ARVN division at Xuan Loc, Dung expected a cake walk. 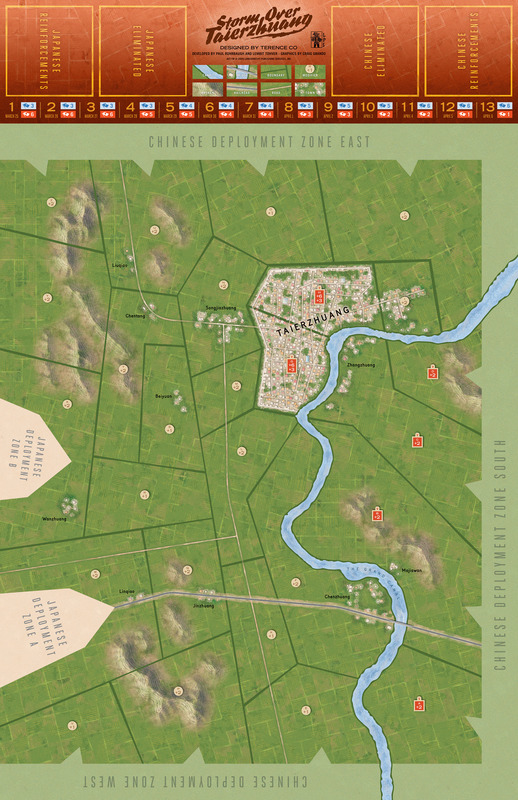 See the Storm Over Taierzhuang game map.